Our favorite day of the year is here again! Come celebrate Record Store Day 2019 with us on Saturday, April 13! We'll be opening an hour early that morning starting at 10:00 AM with as many exclusive RSD titles as they will give us for your collecting pleasure (while supplies last)! We'll also have an all-day sale where all other non-RSD vinyl will be 15% OFF until close at 1:00 AM, including already marked-down sale items, used titles, bargain bin finds, box sets, everything on the collectors' wall, and of course, our selection of new titles! There will be free live music on our stage for all ages starting at Noon, featuring seven bands (! ), finely curated by Cold Lunch Recordings, perhaps our biggest and best lineup ever (see below for details)! Plus, we'll have Vinyl Tap RSD t-shirts, kids' shirts, and tote bags for sale, designed by Caroline Bowman and printed by Life and Limb Printing Company. Look out for all-day drink specials for those 21+ with ID on libations from our sponsors, Belle Meade Bourbon and Dogfish Head Beer (including Grateful Dead American Beauty Pale Ale and The Flaming Lips Dragons & Yum-Yums Pale Ale), and delicious treats from Nashville's Caity Pies! We'll be raffling off a Dogfish Head RSD turntable, tapestry, pint glasses, blacklight posters, and vinyl, which are all Grateful Dead American Beauty themed and designed. And if that wasn't enough, there will be lots of free RSD swag given away with purchase (while supplies last), including RSD tote bags, Queen Bohemian Rhapsody movie posters, record label CD samplers, buttons, stickers, and so much more! It's gonna be a blast, so don't sleep on this one! Come early and stay all day! Set times to be announced soon on social media. VINYL TAP'S ANNUAL BLACK FRIDAY SALE! Snag all your favorite titles at our biggest sale of the year! 15% Off all non-RSD titles in the store! New and used! This Saturday the 22nd, we'll be joining record shops across the country in celebrating our favorite holiday, RECORD STORE DAY! Come enjoy live music on our indoor and outdoor stages, bbq from Shotgun WIllie's, an exclusive beer from our neighbors at Southern Grist and 15% off ALL vinyl! Sponsored by Cold Lunch Recordings, Tennessee Brew Works, Codigo Tequila, Southern Grist and Dogfish Head. Join us and Vinyl Me, Please for The Spins featuring VMP's January Record of the Month Panda Bear Person Pitch! We will be celebrating Noah Lennox, aka Panda Bear, and everything that went into making his landmark album. 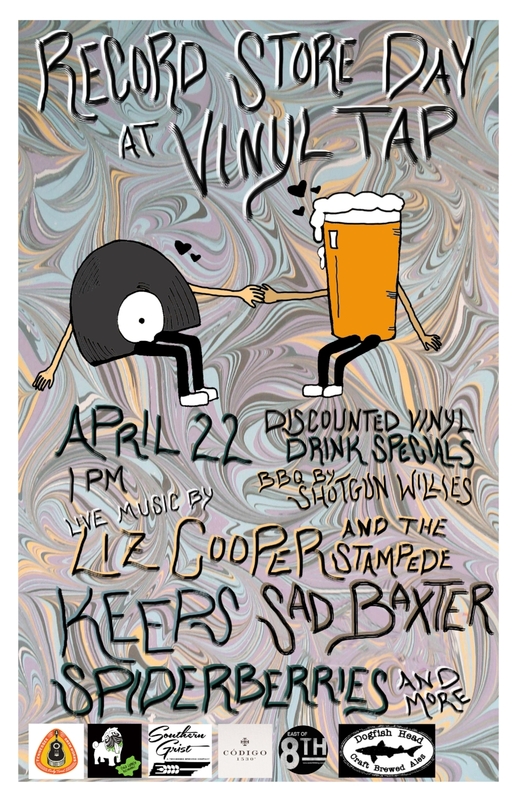 Enjoy a night of music featuring music, meeting the local vinyl-loving community, & drinks. Who knows, you could even end up taking home your own copy of Panda Bear Person Pitch on vinyl. RSVP and invite friends here. We'll be ringing in 2017 with drink specials and the best playlist in town, curated by THE Todd Hedrick. Join us and Vinyl Me, Please for the holidays as we celebrate a legend, Nina Simone, with an essential album from her catalog, the Vinyl Me, Please December release: 'Nina Simone Sings the Blues'! Enjoy a night listening to soul, jazz, and the blues, meeting the local vinyl-loving community, and drink specials, & get the chance to walk away with a free copy of the exclusive Nina Simone record. Event will run from 6 - 9 PM on Thursday, December 15 at Vinyl Tap at 2038 Greenwood Ave., Nashville, TN 37206. "Craft beer and vinyl records unite at Todd Hedrick’s new East Nashville hang, which opens this week in the former Family Wash building." Take a photo tour and read more here. Wax and drafts are now spinning and pouring in East Nashville! Read more at Noble Nashville.